These two huge bullaun stones ar situated in St Stephen's Graveyard at the west end of Irishtown, New Ross. The graveyard lies inside an early ecclesiastical enclosure. A small stone grave enclosure is situated in the centre of the graveyard, it was probably built using stones from St Stephens chapel which once stood near here. 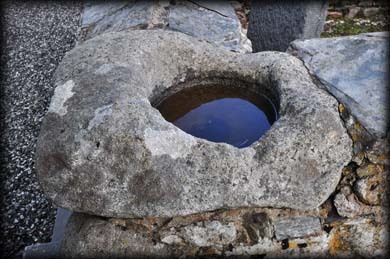 The bullaun stone, pictured left, which is built into the top southwest corner of the wall is 0.7 metres long with a single basin around 0.34 metres in diameter. 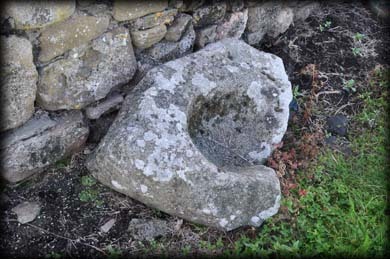 The other bullaun stone lies against the north wall of the enclosure. It is 0.61m in length by 0.44m wide with a single basin. Situated: From New Ross head east for Irishtown. The bullauns are located at the centre of St Stephen's graveyard on the right as you leave Irishtown. Discovery Map 76. S 7292 2803. Last visit Sept 2015.